We made it!!! We're back in America. After 3 flights spanning 17 hours in the air we finally arrived in Phoenix Arizona. Everyone seems to ask, why Phoenix? We wanted to spend a couple of days on the Grand Canyon and this meant we needed a car. Phoenix was the closest driving wise and meant that we would have a few days to recover from our flights so Phoenix provided the perfect place! We spent a little under 2 days recovering from jet lag in the beautiful area of Old Scottsdale, better known as the Beverley Hills of Phoenix by our Uber drivers. 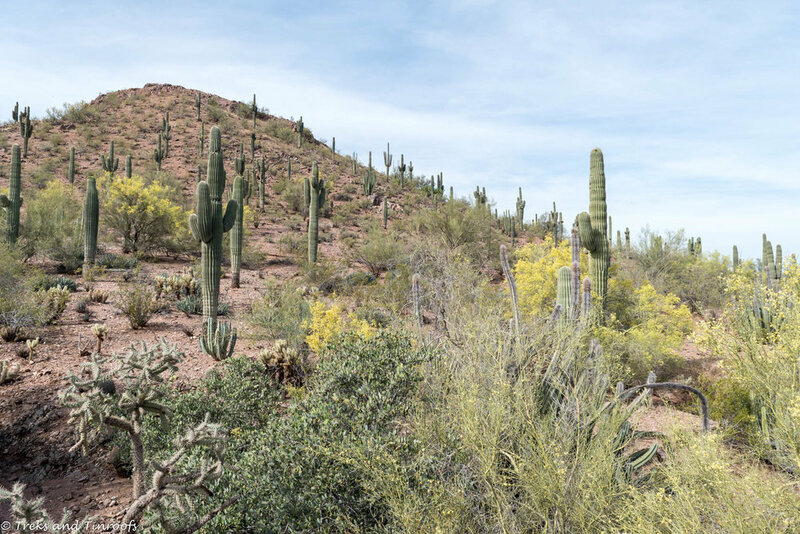 But it wasn’t all sleeping, we managed to get out and explore the local strip and the Phoenix Desert Botanical gardens. The gardens were great, so much more than we expected. We spent the morning exploring and finding out that there are more than 20,000 plants there, some which are rare, threatened or endangered! If you are in Phoenix we would highly recommend it. Oh and our first night what else would have for dinner but... PIZZA and yes it was amazing. We had great Mexican in Scottsdale too, the food was good everywhere we ate, but we forgot how big the serves are in America. We soon learnt to share meals. As we were driving to the Grand Canyon and then onto Las Vegas, we needed a trusty steed. We picked up our hire car, ‘Bluey’, a Hyundai Elantra with the steering wheel on the wrong side. It was no Pajero but with a huge boot to fit all our suitcases and enough grunt to get us to 7000ft in altitude she did us well. About the best way to explain the drive from Phoenix to Sedona is surprising. We never expected the soaring mountains it was a far cry from the dry barren deserts we were expecting. Driving on the ‘wrong’ side of the road was scary, turning at lights was the weirdest feeling! but was made easier with traffic as you just follow everyone else. They have this rule there that if you are turning right and the light is red, if its clear then you can go, we got the hang of that one quickly after a few horns from fellow motorists behind us. 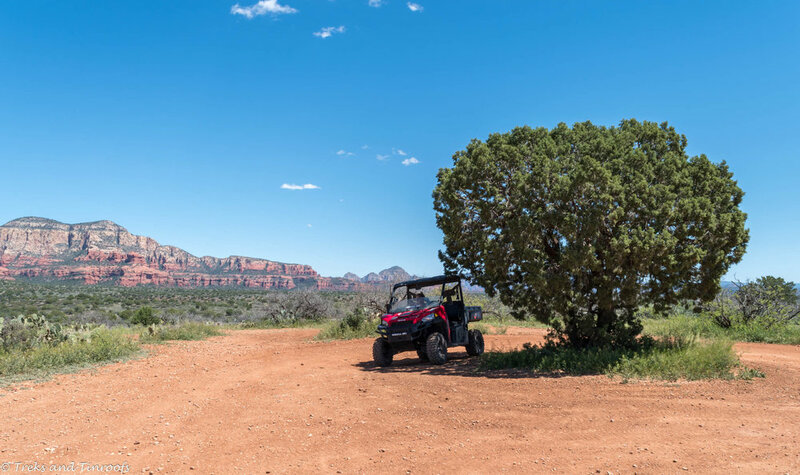 We had done a little research about Sedona and knew it would appeal to us, ATV/Buggy’s, great 4wding and amazing scenery; we just didn’t know how much we would love our afternoon there. As you drive into Sedona, we felt like we were entering a country and western movie, red rock with flat tops. What amazed us the most is how the city has been built around the mountains and provides a perfect backdrop for all things adventure. We knew we wanted to explore as much as possible so we hired a 4wd buggy to explore some tracks only accessible by a 4wd. We had so much fun out there! We missed the Paj but with the wind in our hair and us tackling some of the rocky sections we soon forgot. The back drop was incredible, in places reminding us of our Kimberley trip. We spent 3 hours exploring and we had so much fun, we would have loved to do more and explore more tracks, but we had to get to the Grand Canyon before dark. We will coming back to explore this beautiful place and could easily see ourselves spending a week here, so many walking and hiking tracks or 4wd tracks if you can get your hands on one. From red rocks to soaring pine forests, the drive from Sedona to Flagstaff was utterly breathtaking. 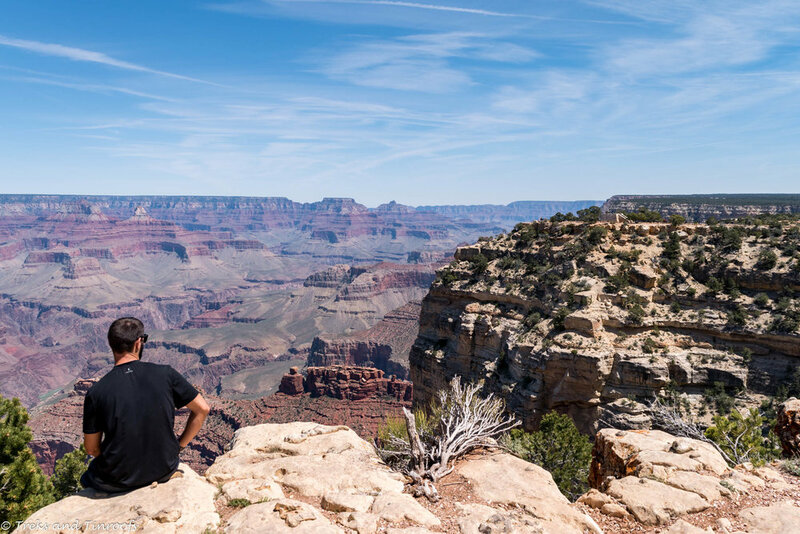 Rated in the top 5 most scenic drives in America, we wanted to stop and take it in but there is absolutely no where to pull over and really soak up the scenery. The road snakes up the side of a mountain among forest before opening to views of snow peaked mountains in the distance. This place must be on so many peoples bucket lists, but the photos and everyone’s stories really don’t prepare you for how amazing this place is! It doesn’t seem real, it felt like we were looking at a painting. We arrived just before sunset and made our way to Mathers point WOWee! Our photos don’t even do this place justice! 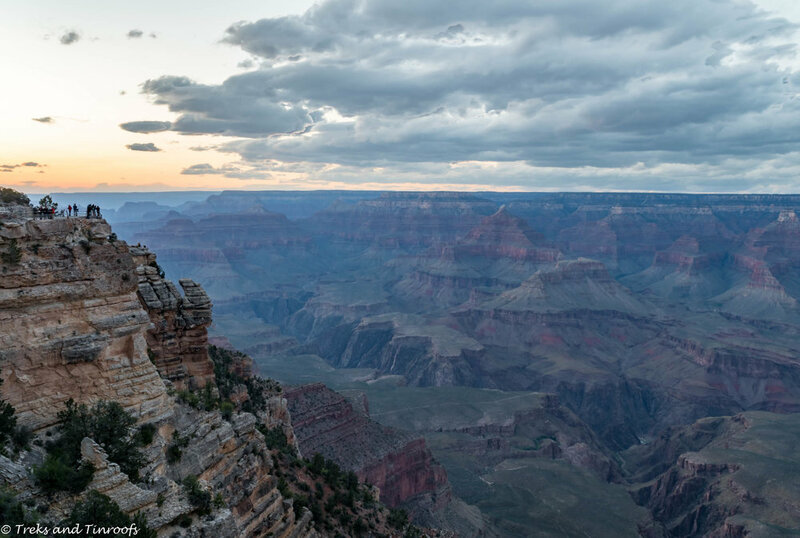 We had done a lot of reading about the best places for sunrises and sunsets and this one was close to our accommodation at Yavapai lodge. We got up for 2 sunrises and they were both SO worth it. It was cold…. Scrap that, utterly freezing. Around 0 when we would get up and the wind made it even colder, so we rugged up and off we went. We had been told by a number of our friends that we must do a helicopter ride, so twisting our arm we booked in for a morning flight. This left us truly speechless, it’s amazing how getting up in the sky gives you even more perspective and you really appreciate mother nature. There was even snow still on some of the northern rim! We only did a short flight, but would have loved to do a longer one to really see more of the canyon. We spent the rest of our day trekking part of the Hermits Rest rim trail. You can catch the bus to most stops, but if you can, the walk is eye opening. We walked the first section which took us about 3 hrs then hopped on the bus for the rest. This trail and lookout locations would have to be our some our favourites while there. The lookouts are open and the span of the view is just…I don’t have any words. 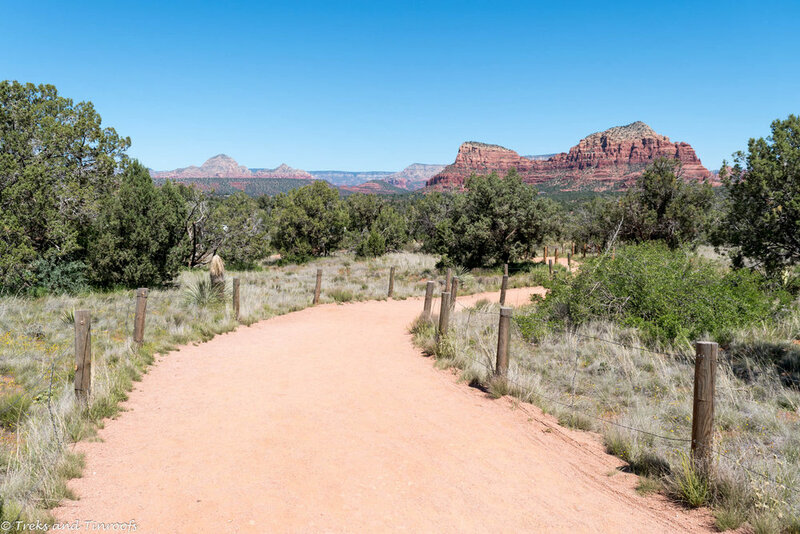 We couldn’t recommend this trail enough, it truly shows the expanse of the canyon and makes you feel like an ant. 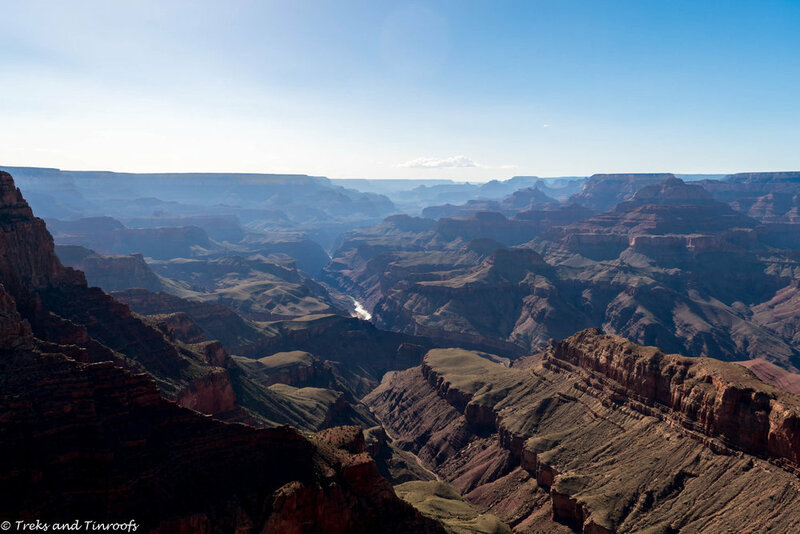 Say what you want about America, they really know how to do national parks, You literally are walking on the edge of the rim in most places with no barriers. You almost forget you are near the road and close to shops, restaurants, hotels. The best way to describe it is it felt like the remoteness of The Bungle Bungles in the Kimberley but with the luxuries of a country town. Sorry about all the photos, we couldn't just pick one! This truly is a beautiful part of America and if this is how we start off, we can't wait to see the rest.